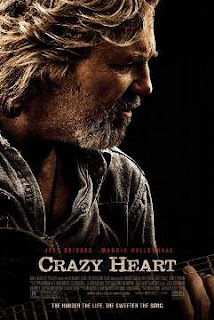 10) Jeff Bridges (as fictional outlaw country singer Bad Blake) sings and plays guitar on T Bone Burnett’s original soundtrack – and he’s good. Really good. 9) You have to do a double take to make sure Bridges isn’t Kris Kristofferson. 8) Colin Farrell (who also sings) puts away the Irish swagger just long enough to impress audiences with his short but memorable performance as Bad’s humble protégé Tommy Sweet. 7) As Bad sings, “I’ve been blessed and I’ve been cursed, all my lines have been unrehearsed” you can feel his hard history. 6) Journalist Jean’s (Maggie Gyllenhaal) heart bleeds for Bad and she makes ours bleed for her. 5) Bridges’ ability to portray Bad’s inability to stay on track and out of trouble. 4) You root for Bad even though it takes every ounce of his strength to simply talk and breathe between shots of whiskey. 3) Bad says he plays “sick, drunk, divorced and on the run” and you believe him. 2) Stories of redemption are always interesting, especially when there is a soundtrack full of heartache and grit to back it up. 1) Bridges makes an alcoholic-four times divorced-outlaw country singer who is forced to play in dive bars and bowling alleys one of the most charismatic and likeable characters I’ve seen in a movie in a long time. I can not wait to watch Jeff Bridges accept his Academy Award! I am impressed that a movie made me root so much for two actors I normally refuse to deal with (Farrel, Gyllenhal). I did wish there was a little more Robert Duval. He is always that charismatic yet subtle voice of reason. I loved watching him sing to Bad while they fished on the lake. I am not a fan of Country music, but I can appreciate the beauty of the movie's old soulful country versus the bubble gum pop cross-over crap that pisses off people like Bad. Thanks for recommending it, LL!! Makes me want to see it this weekend – I'm so intrigued! One of the few movies I'll see more than once. Blog's lookin' good, Laura!